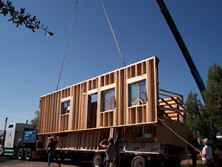 Begin unloading of the first truck and all panels using a crane. 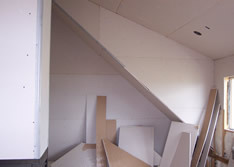 For this project 3 trucks were used to carry all the componets, walls, and beams. 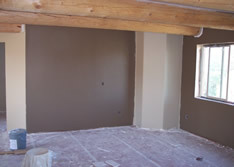 First 40' wall is set in place. 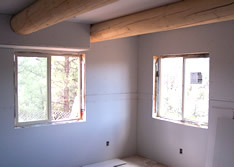 All the walls are stained, chinked, and come with the windows pre-installed. 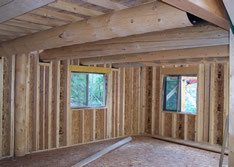 All walls around the main level of the home are set and braced using 2x6. 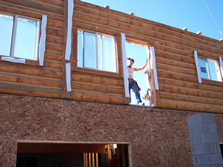 Gable ends are set in place atop lower walls. 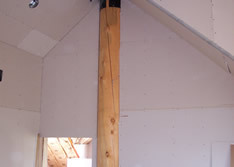 Also, corner posts connect the two walls at the joint for a tight fit. 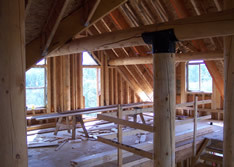 Interior posts, glulams, and beams are attached using brackets. 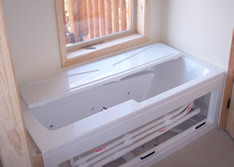 Everything pictured is included in shell costs. 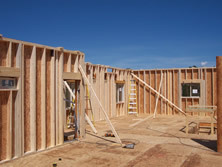 Home is ready to begin the construction of the roof system. 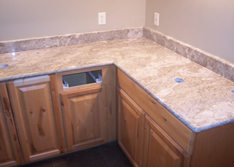 No other product can produce results like this in less than 1 week! 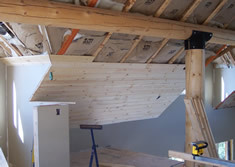 Shed dormer is set in place. 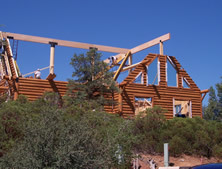 Also, rafters for the roof system are being added to create the roof line. 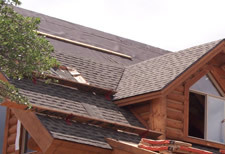 You have the choice for any type of finished roof. 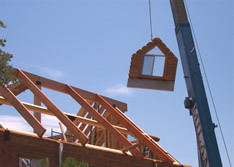 One of the two 8' peak dormers is being lowered using the crane. 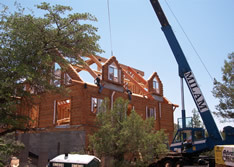 Rafters are set on this side of the home. 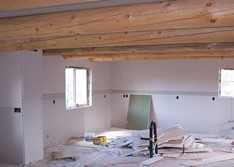 The loft support beams above the kitchen have been set in place. 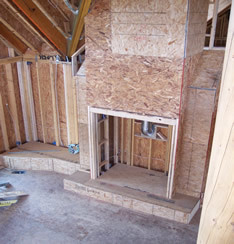 The floor system is added so the crews can work on the upstairs level. 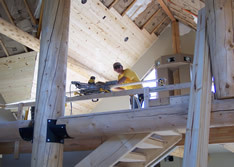 The stairway, which is provided in the price of the home package, is set in place and leveled off. 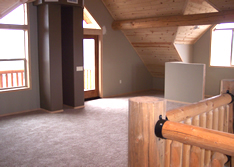 This stairway provides direct access into the loft and upstairs bedroom. 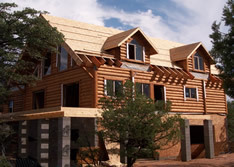 The home is completely covered with all sheathing and roof rafters supplied in the package. 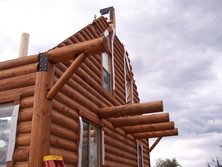 Also, the frame for the front deck is completed. 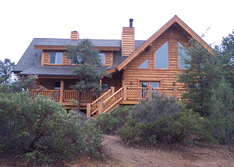 A view from the back of the home. 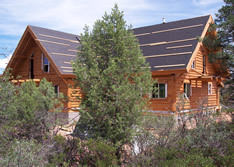 We are now ready to add shingles. 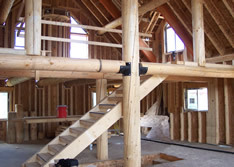 A view to the loft area, with the full log posts and beams providing accents and characteristics unique to our building process. 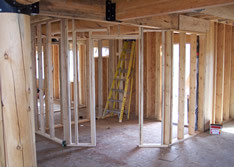 We have now begun to start internal framing of all rooms, vents, and fireplaces. 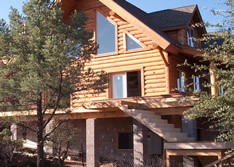 A street side view from the beginning of the week. 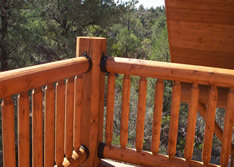 The covered decks are built and the support posts are pre-stained. 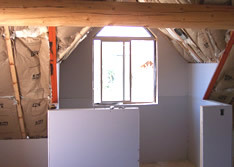 Another look at all the beams and interior partitions which are all provided in the kit price. 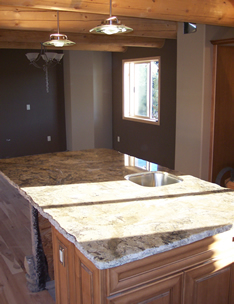 A full bar is added in the loft area. 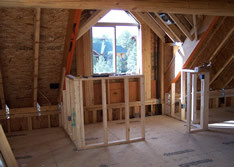 The owner has intentions of a pool table in the loft and customized the bar around the peak dormer. 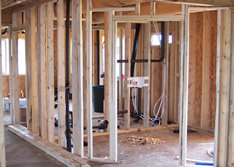 By the end of this week we have started the HVAC installation for the entire house. 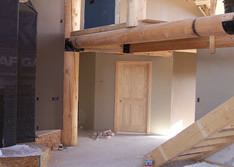 The owner decided to build a large, custom fireplace for the massive great room. 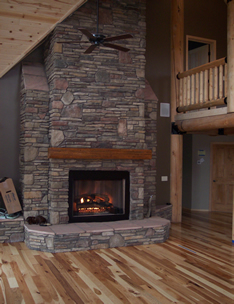 The owner intends to add rock around the entire fireplace for a large focal point. 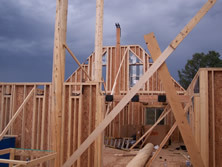 The home is dried in and shingles will be added at the start of next week. 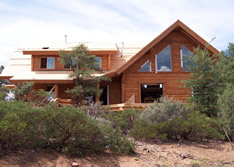 The finished roof, with the High Definition 40 year shingle, with gutters and downspouts will be completed this week. 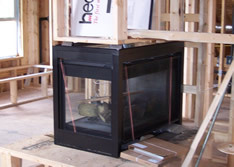 A see-thru fireplace is installed in the Master Bedroom. 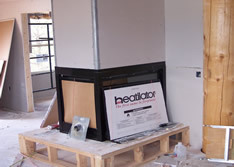 The fieplace with be finished with flagstone hearth and stone veneer. 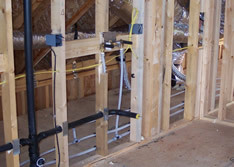 Plumbing is being placed in all bathrooms and kitchen, and electrical wiring is being installed. 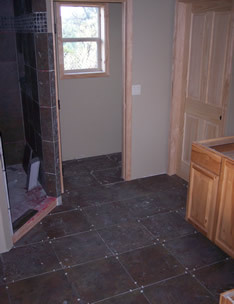 This is a close up view of the stubs for the Master Bath. 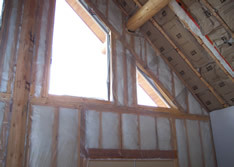 Insulation is being installed around the house in week 6! 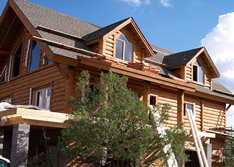 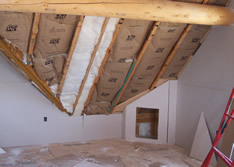 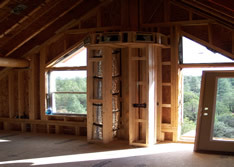 The homeowner can choose any type of "R-Value" for the roof and/or walls. 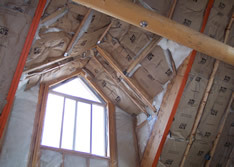 Insulation is being shown in the 8ft Peak Dormer. 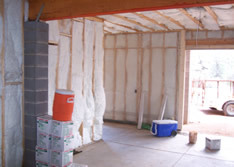 Complete insulation of the lower level 2 car oversized garage. 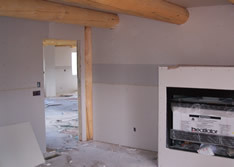 Week 7 & 8 are complely dedicated to the installation of the drywall, mud, and texturizing of interior walls. 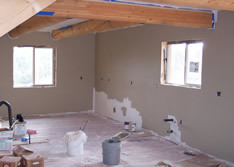 Choose from drywall, tounge and groove, and/or "D-Log" (wall as seen in week 13). 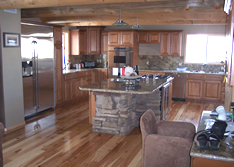 Before cabinets, flooring, and other finish material are installed, the owner added paint to all interior rooms to give the cabin a personal and custom look. 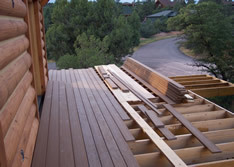 Off of the main living room, installation of the no maintenance TREX Decking is being applied. 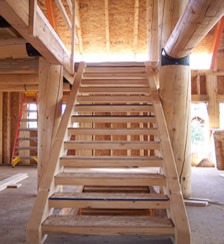 Also the main staircase is built leading guests from the driveway to the front entrance located on the second level. 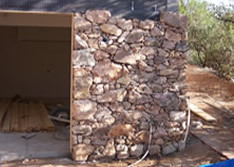 Natural stone, excavated in the local Rim Country, is being applied to the exterior surrounding the garage. 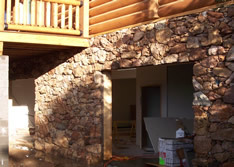 Cultured stonework is also going to be applied to all interior fireplaces. 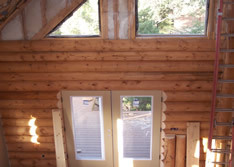 Tongue and Groove (T&G), is being installed during the next two weeks of construction. 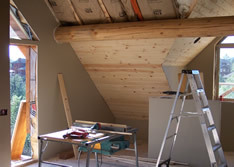 This will be applied to the great room and loft ceiling. 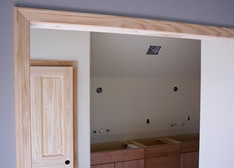 Also, all interior doors will be hung and windows and doors will have trim applied. 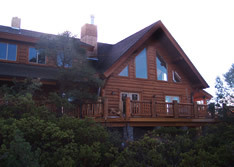 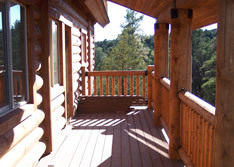 All exterior rails and balconies were set and the interior D-Log was installed on the main Window wall. 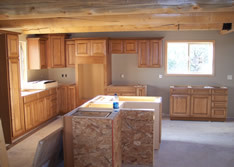 Cabinets for the Kitchen and bathrooms were delivered and installed. 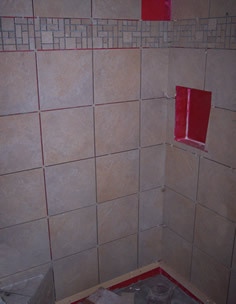 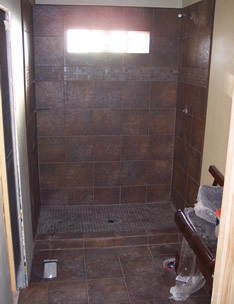 This entire week was devoted to the installation of tile for the floors and showers of all bathrooms and laundry room. 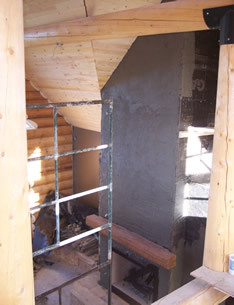 Also, the main fireplace had the cement applied so we can begin interior stone next week. 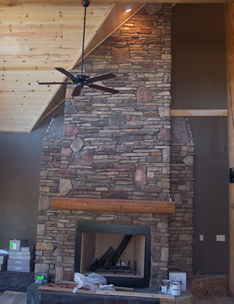 Completion of the Interior Fireplace has been finished with a Stone Veneer blend. 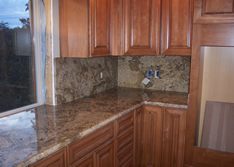 Impressive Granite installed in the Kitchen and all Bathroom countertops. 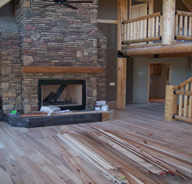 Hickory Hardwood floors are being installed in the living room, dining room and kitchen. 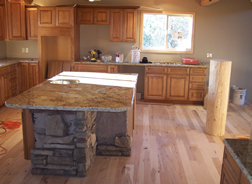 After installation, the wood will be treated with a urethane to bring out all the true characteristics of the wood. 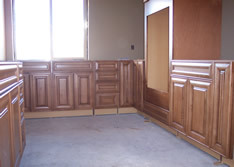 Notice the sharp colors and detail of the Hickory Hardwood after 3days and 3 coats of urethane. 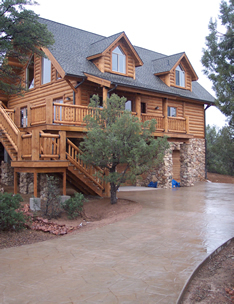 Amon builders designed and poured the concrete driveway with flagstone stamps which blend seamlessly into the exterior stonework. 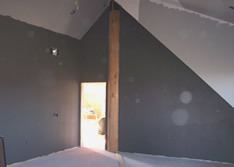 All 3 bedrooms and loft area received carpet installed in about 3 days. 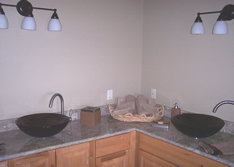 Most of this week was dedicated to installing all plumbing fixtures, toilets, sinks, etc. 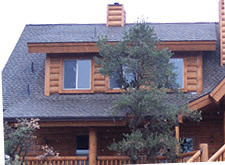 Top of the line Dacor appliances have been delivered and the home is finished and the certificate of occupancy was issued by the town of Payson.